The Punisher season 2 has dropped and fans are already hyped over the bloody fight scenes and knockout performances by Jon Bernthal, Ben Barnes, and several other main cast members. *Spoilers ahead* This season showed Frank as a flawed yet caring father figure, explored Billy’s mental instability, and further blurred the lines between what’s right and wrong in terms of delivering justice. It introduced fans to Amy, Pilgrim, and several other new characters, but there’s a new face that’s also worthy of praise, even if she was only in one scene for about five minutes. In episode 7, Billy/Jigsaw and the gang rolled up on the wrong manager during a robbery attempt at a check cashing place. The plan was simple — tie up the employees, grab the cash in the register and the vault area, and make a quick getaway. But, they weren’t ready for the manager’s surprising reaction to their weapons and masked faces. 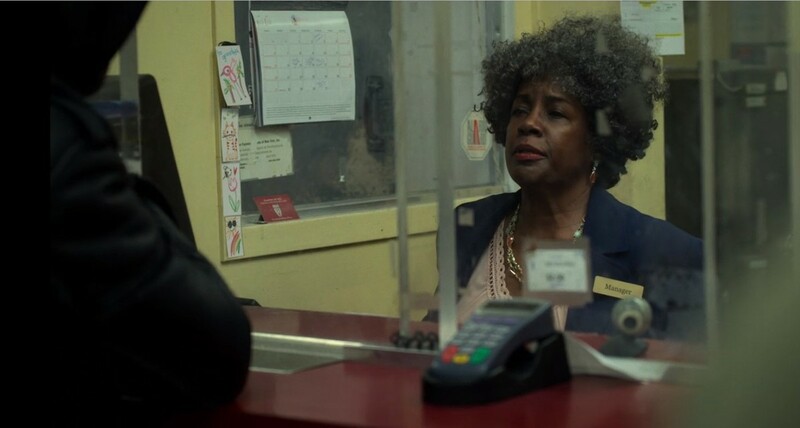 When they entered the store, Billy summoned Lillian, a black woman with salt and pepper hair, and demanded that she press a button to let them in the back unless she wanted to die. Billy tried to up the ante by threatening to slip a grenade under a cash slot. Lillian didn’t flinch for one second as she said it wouldn’t fit. Did I mention that she called Billy a dumbass and told his crew to take all of their sorry selves out of her establishment? Yep, that’s one way to make an impression. Unfortunately, Lillian’s punk co-worker opened the door, but Billy admitted that he appreciated her personality and called her a “crazy old bird.” Lillian didn’t make a large overall impact on the storyline, but she was one of those side characters that makes a scene feel authentic with a bit of humor mixed in. The truth is, there are people who own check cashing places, convenience stores, and other small businesses, and they are fed up with folks who think they can waltz in and rob their establishment. I wouldn’t necessarily recommend talking trash to someone who is holding a gun (and who is possibly psychotic) but I can understand why Lillian didn’t want to acquiesce to their demands so easily. It’s obvious that her business has been been subject to crimes before or is in a high-crime area (there was bulletproof glass and a solid door) so she has a low tolerance for anyone running up in her place with ill intentions. And, Lillian’s emotional attachment and dedication to her establishment comes with a sense of pride that gives her courage in the face of the most terrifying person. It was admirable and very badass to see her stand up for her legacy. So, here’s to Lillian — an expert at insults, a fearless leader, and a woman who could probably run her own army if she ever decided to sell the family business.